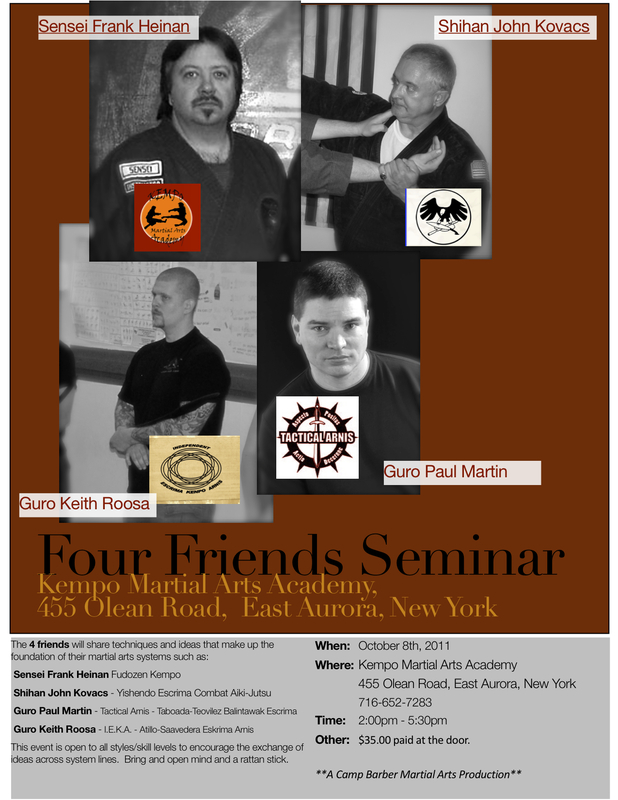 4 Friends Seminar, October 8th. On the heels of working with Dan Donzella, I have the chance to share the floor with three excellent martial artists. I jumped at the chance to do this seminar for a lot of reasons – like the chance to work with Frank Heinan and John Kovacs, but, the big reason is the chance to see Keith Roosa in action. Keith has been digging into Ising Atillo’s “Attilo Balintawak” and I can’t wait to compare/contrast what he is learning to the “Cuentada Balintawak” version I learned from Bobby Taboada. As students of Dr. C. Jerome Barber, PhD, we were both required to explore other arts and systems while we were training with Jerome. This goes for all his students. When we find another system that seems like a good fit, Jerome encourages us to explore it as deeply as possible. Thanks to this “Liberal Martial Arts” approach to training I’ve been introduced to many great systems and artists, but Bobby Taboada and Balintawak (Cuentada Balintawak) were such a powerful influence on my growth and understanding that they still remain a major component both technically and conceptually in TacArnis training. I can’t wait to share some of the fundamentals Cuentada Balintawak and share the floor during the last hour with Keith, Frank, and John. But, like I said, I’m going to be picking Keith’s brain (and ‘stealing’ a few drills and skills if I can) while I’m there too. Just like boxers, kick boxers, or MMA’ers, TacArnis students train to hit and/or be hit. We have to condition our joints, our muscles, and our nervous systems in order to give and take a hit. Unlike boxers, kick boxers, or MMA’ers though, TacArnis students practice with weapons as well as empty hand. Whether it’s hitting an opponents weapon as a block or striking vital areas in order to stop a ‘bad guy’ (or guys or guys and gals…) swinging sticks in patterns in the air is totally different from the impact, drag, and reverberation of really hitting something. Even the ‘middle ground’ of using light contact striking with a live partner won’t condition the body for throwing a committed strike with a stick anymore than slap boxing prepares boxers for contact. Forces the striker to apply adjustments between swinging air strikes and really hitting something. There’s also a bit of ‘nostalgia’ in training with a tire for this. It’s a cheap, readily available and improvised training aid… just like most of the early training tools are. If it ain’t broke why spend way too much money on something that will only be ‘as good’ (or possibly not as good since it wears out faster). Sensory Awareness… Beyond Self Defense, I love TED Talks! TED stands for Technology, Entertainment, and Design and is the acronym for an amazing event that brings the best of the best in each of these fields together. By the ‘best of the best’ I don’t mean just technical skill or artistic ability. TED conferences are about positive change, making a real impact on the world around you. For example this talk about Listening and Hearing… spend 7 minutes and change (pun intended) watching this TED Talk. Memorial Day – Dedicated Musicians play Taps no matter what. Snow, rain, heat, cold… these musicians are there no matter what.